Today, most people think that the Jewish religoin has always taught a belief in heaven and hell and a final judgment of souls, but this is not the case! In fact...nothing could be further from the truth! *Abraham and his children would worship EL alone; they would worship no God but EL. This "covenant" continued to Isaac son of Abraham, then EL and Jacob (Israel) renewed the covenant. Then, to escape famine, the Israelites went into Egypt, but were later made slaves to the Eqyptians. The Israelites cried to EL for protection; to "save" them from slavery. Then EL appeared in a burning bush to Moses; a former Hebrew "prince" in Egypt who had fled that country for killing an Egyptian slave-driver. With the divine help of EL, Moses returned to Eygpt and demanded that Israel be freed. The Pharoah (king) of Egypt refused. So, EL sent 10 plagues upon the Egyptians, and Pharoah freed them, but changed his mind. Pharoah and his armies chased the Israelites to a "Sea of Reeds" where EL, via his prophet Moses, parted the "Sea of Reeds" and crossed over, but Pharoah and his armies drowned in the "Sea of Reeds". EL commanded Moses to "utterly destroy" the Canaanites (men, women, and children) and take Israel to inherit the land of Canaan; as He had promised Abraham. The Israelites tried to conquer Canaan, but failed. They conquered some Canaanite cities, but not most. For hundreds of years they lived along-side the Canaanites as 12 tribes. Then a war-lord came who name was David, and became the frist true "King" of Israel. His son Solomon also reigned over the Kingdom of Israel. But, only a few generations after Solomon died, the Kingdom split into the Kingdom of Israel to the north, and the Kingdom of Judah in the south; with separate kings. They kept the Law of Moses, not because they thought it would help their afterlife (there was none), but because they believed that EL would send them "blessings" if they did, but "cursings" if they did not. About 734 B.C., the Assyrians (kingdom in northern Iraq) invaded the northern Kingdom of Israel, because the king of Israel (????????????) had refused to pay taxes to Assyria. The 10 tribes of the northern kingdom were taken back to Assyria as slaves. Later, they became "lost" to history. They became known as "the 10 lost tribes". Nobody knew where they went after they left Assyria, but they did NOT return to Palestine! They became "the 10 Lost Tribes". Early American colonists used to believe that the American Indians were the 10 lost tribes of Israel, but they are not. American Indians are not Semites, but Asians closely related to the Tuvan tribes of Siberia. Many used to believe, and some still do today, that the Anglo-Saxons are the 10 lost tribes. But few scholars think this is the case. For hundreds of years, the Pashtoons of Afghanistan, Pakistan, and Kashmir claim to be their descendants. And recent DNA tests have confirmed this! The Pashtoons are the "lost tribes" of Israel that the Assyrians exiled from Palestine 700 years before the common era. 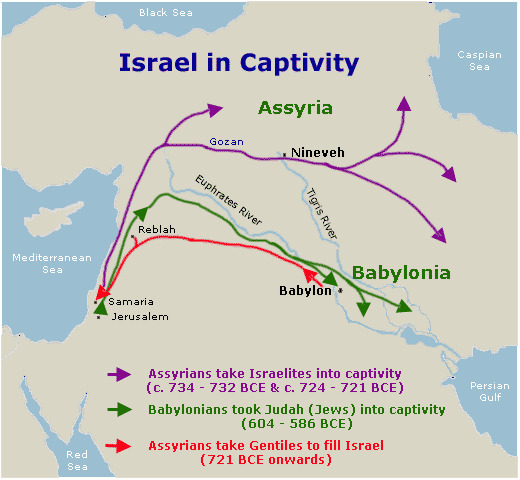 About 600 years before the common era, the Kingdom of Babylon does the same thing to the Kingdom of Judah as the Kingdom of Assyria did to the Kingdom of Israel; invade, destroy, and exile the Jews. What happened to the 10 Northern Tribes was now happening to the 2 Southern Tribes; Judah and Benjamin. About 600 B.C., the King of Babylon, a kingdom just south of Assyria, conquers the Assyrians! His name is King Nebuchannezzar ("Ney-boo-khawn-nez-zar"). He demands that the king of the southern Kingdom of Judah (whose inhabitants now call themselves "Jews") pay taxes to him. The King of Judah (?????????) refuses; believing that Egypt will protect him from the Babylonians. The prophet Jeremiah arises and warns the king of Judah to pay tax, or the Babylonians will destroy Jerusalem, and the Temple, and take the Jews back to Babylon as slaves. But Jeremiah is not believed, and is finally threatened with death. Jeremiah has to hide in order to escape death because the king of Judah does not like what he is saying. Finally, King Nebuchadnezzar send his vast Babylonian army to Judea, and destroys the city of Jerusalem, and the Temple of Solomon, and takes the Jews back to Babylon as slaves. This is known as the "Babylonian Captivity". 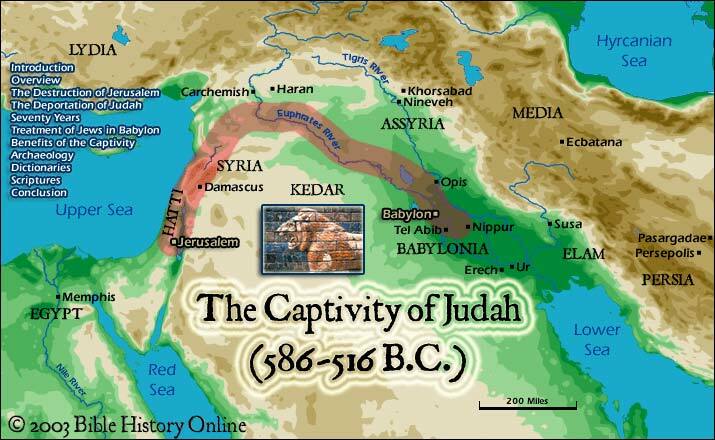 The Jews would be serfs in Babylon (souther Iraq) for 70 years. One of the captured Jewish children of noble birth is named Daniel; who refuses to eat kosher food. King Nebuchadnezzar appoints his Magi ("wise men") to be the teachers of Daniel and the other captured children of royal blood. The Magi (called "Magoi" in Greek or "Magusseans" in Aramaic) are the "Magavan"; a special sort of Zoroastrian priest who specialized in interpreting dreams, interpreting the "signs in the heavens" (astrology), and in prognostication (prophecy), and in the arts of healing (physicians). They had been around for many centuries, and many of the kings in that part of the world used them as advisors. The Magi were a priesthood, but also a "craft-guild". They were in high demand. Like all craft-guilds in the ancient world, they kept their craft a "secret". How did they interpret dreams, or interpret the stars, or heal? If they told everybody, then anyone cold be a Magi. So, they had "secret" which they kept to themselves; only teaching their own carefully selected apprentices, and the young Jewish boy Daniel was one of them. Daniel is once thrown into a lion's den to be eaten by lions, because he refused to worship a statue of the king. But the lions did not harm him. Daniel is once thrown into a huge kilm ("fiery furnance") because he refuses to worship an crocadile as a "god". But neighter Daniel nor his two companions are harmed. Some divine force seems to be protecting him. Daniel has the ability to interpret dreams better than the Magi, and is appointed by King Nebuchadnezzar to be the "Rad Mag" ("Chief Magus") of Babylon; a position which Daniel does not reject, but accepts. Certainly, if the religion or practices of the Magi were "evil" or in any way opposed to the Jewish religion, Daniel would have rathered suffered death than accept the position of Rab Mag ("Head Magus")! About 610 B.C., a man-child is born in nothern Iran, in the land of the Medes, by the name of Koresh (Greek: Cyrus). He is the son of the king of the Medes. To protect him from assassination, his parents give him to local sherperds to raise. But by the time he is a young man, he is raised by his grandfather (the king of the Medes). Cyrus later becomes king of Media, king of the Aryan tribes of the Medes, and is an amazing warrior. He conquers all the tribes around him; including the Persians. He discovers that many of the Persians (who called themselves the "Farsi") can read and write (unlike the Medes), and he decides to make them the bureaucrats for his new empire. He makes Persian (Farsi) the universal language of his empire; which becames known as the "Persian Empire". About 587 B.C., King Cyrus of the Medes and Persians conquered the Kingdom of Babylon, and soon finds that the king of Babylon (Nebuchanezar) had enslaved the Jews inside that kingdom. King Cyrus then decrees that the Jews should return to Judea, and King Cyrus decides that he could rebuild the city of Jerusalem and the Temple that the Babylonians had destroyed. King Cyrus decides that he will let the Jews go back home to Judea, and he (Cyrus) will give them money to rebuild their Temple which the Babylonians destroyed. King Cyrus is the first person in history to be called "Christ", and was called so by the LORD, God of Israel. The official title of King Cyrus was "Shahshanshahe"("King of kings"). He was not a pagan like Nebuchadnezzar. He did not worship idols. He was a Mazdayasni ("Mazda-worshipper" i.e. Zoroastrian). The Jewish religion changed quite a bit thanks to the Babylonian captivity! Before it, the Jews did not believe in any Afterlife. When you died you went to the "grave" and your "RUH" (soul or "breath") went back to EL (Eccl: 12:9). But your consciousness did not continue, and that was the end of all your thoughts and plans. During their 70 years in Babylon, the Jews came into contact with the Mazdayazni (Zoroastrians), and learned many new doctrines from them. Before their enslavement in Babylon, the Jews did not believe in Heaven or Hell or in the Resurrection. They believed that once you are dead you go to SHEOL ("the Grave"), and that was the end of all your thoughts and plans. But while they were in Babylon, the Zoroastrians taught them about "Paradise" (a Zoroastrian Persian word meaning "Garden"), and about the Fire (Hell), about a Final Judgment of all souls, and about the Resurrection. The Jews never knew of these concepts before they had met the Zoroastrians in Babylon! While in Babylon, a Jew named Daniel became the favorite of King Nebuchanezzar. 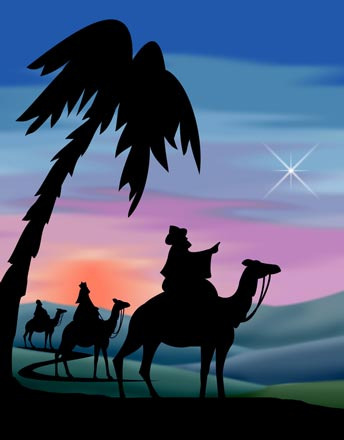 The Magi (wise men) of the king could not interpret his dreams, but Daniel could. So, the king made Daniel the Rab Mag ("Chief Magus") of all the Magoi. Daniel did not refuse this; although he had refused to eat unkosher food, and he had refused to worship a statue of the king. Daniel was even thrown into a den of lions because he refused to worship the statue of the king. But the lions did not harm him. He and two other Jews were thrown into a huge furnace because they refused to worship a pagan god, but the fire did not consume them. But, Daniel did not refuse to become the Rab Mag of Babylon. As a young boy in Babylon, the teachers of Daniel had been the Magavan (called "Magoi" in Greek). The Magavan were a special class of Zoroastrian priests who specialized in interpreting dreams, in interpreting the stars, and in prophecy. They were also known to be great healers. In other words, Daniel became a Zoroastrian priest; the Rab (Head) of all Magoi in the Kingdom of Babylon (see Daniel chapter 5). King Cyrus then conquers Babylon, and issued a decree to let the Jews return to Judea, and to rebuild the Jewish Temple and the city of Jerusalem. King Cyrus became a "Savior" of the Jews, and is called by the God the Israel "My Christ". Many of the Jews in Babylon convert to the Good Religion. But they did not become Mazdayasni ("Mazda-worshippers"). Why? Because, as Jews, their fathers had made a "covenant" with EL to worship him and him alone! So, they could not convert to the Good Religion completely. They could not be "initiated" into the Good Religion. But, they could "borrow" many beliefs from the Good Religion and incorporate them into a new Jewish belief system. The Jews who "borrowed" from the Good Religion were called FAROOSHIYM (in Hebrew it means--"Persians") because they follow the "Persian" religion. The "Persian" religion meant "the official religion of the Empire of the Persians"; i.e. the Good Religion of Zoroaster. In Greek their name became "Pharisees". Some of the Pharisees desired to learn the "secret arts" of the Zoroastrian Magoi ("Magi"), and became known as OSSENIYM ("Healers"). Their Greek name became "Essenes". Zoroaster became known as "the Teacher of Righteousness" in the literature of the Essenes. His title in Persian was "Awsho Zardosht" ("Righteous-Teacher Zarathustra"). Other Jews saw what was happening, the pure Jewish religion--the pure and undefiled worship of the God of Israel-- was being "infected" with "Persian" beliefs. Some Jews, especially the Levites (Jewish priests) opposed the entrance of "Persian" ideas and beliefs in Judaism, and they are led by a priest named Tzadok. The Jews who refuse to convert to the "Persian" religion are called "followers of Tzadok" or TZODOKIYM. In Greek their name is "Sadducees". Tzadok became known as "The Wicked Priest" in the literature of the Essenes. Like the Magi, the Essenes did not marry, but were celebate. But some Essenes wished to marry. They remembered the prophecies concerning the three Saviors born of virgins. They believed that if they had daughters, one of them would produce one or more of these virgin-born Saviors. So, they broke off from the main body and became known as NAZAROTH ("Keepers"); meaning the "keepers of the secrets" of the Wise Men (Magi). There was not many of them. In order to marry, then had to leave the Essene convents. They gathered together and built a village which they called "NAZARETH" (Aramaic: "Place of the Keepers"). In the Greek, their name became "Nazarenes". The Pharisees believed in the coming of the "Messiah"; the title used by Isaiah for King Cyrus. But they believed that God would raise up a Jewish "Christ" to save Israel. He would be a king and a warrior like Cyrus, but this time of the bloodline of King David. The Essenes, on the other hand, believed in three Christs to come; not one only. They were closer to the doctrine of the Magi; who taught about the coming of the three virgin-born Sayoshants. One would be a "king". Another would be a "priest". The third would be a "prophet". Because the Essenes knew the "secret arts" of the Magi, they had the ability to prophesy, and they foretold that the priest-Messiah would be called "the Son of God" (Qumran ???????). The Sadducees did not believe in any coming "Savior" or "Messiah". They did not believe in any afterlife. They considered these to be foreign "Persian" concepts. They believed that once you died all went to "The Grave" (SHEOL), and their plans and thoughts ended forever. They believed they had to worship the God of Israel because the God of Israel would protect them from famine and pestilence and from foreigh armies. Yet, the God of Israel did not protect them from the Assyrians or Babylonians. Why? The Sadducees ascribed this to the fact that they had not lived the Torah (Law) correctly. For the Sadducees, there was no afterlife, no angels, no spirits. They worshipped the God of Israel so that He would provide them with good rains, with bountiful crops, and with protection from famine, disease, locusts, infertile women, and invading armies. If a famine did come, if the rains did not come, if the locusts or other pestilence came, or if a foreign army defeated them, it was simply because the people did not obey the Torah (Law) as they should have; that is why the God of Israel did not protect them or bless them as He had promised. The ancient Jewish historian Flavius Josephus, does not distinguish the Nazarenes from the Essenes, but simply refers to them as "an order of married Essenes" (??????????????). About 6 B.C., a "comet" appears in the East, in the constellation of Aries (which represents the Kingdom of Judea). The Magi at Babylon (due east of Jerusalem) know what this means! A Sayoshant ("Savior") promised by Zoroaster has been born, in the land of Judea! They make plans to see Him, and offer Him gifts. *Why would Daniel, a Jew who refused to worship pagan gods on pain of death, agree to become the head of a priesthood of another religion? *Is the Good Religion a "pagan" religion? *Why would the LORD God of Israel call King Cyrus, a Zoroastrian, "Mine annointed (messiah/christ)"? *If EL (the God of Israel) is All-Powerful, why couldn't He save Israel and Judah from the Assyrian and Babylonian armies? *Why did the Sadducees reject the teachings of the Pharisees?